The Drowsy Chaperone is receiving its first off-west-end fringe revival after a spectacular failure with its West End run 3 years ago. I’m not entirely sure why it was so unsuccessful featuring Elaine Paige as it did but the misguided marketing campaign had a lot to do with it I’m sure. It is however also quite a niche piece, it should appeal to any fan of musical theatre but beyond that, I’m not sure how much attraction it has. But relocated and retooled to the Upstairs at the Gatehouse pub theatre in Highgate, this production captures all the charm and effervescence of this delightful show and hopefully it will restore some of its reputation here in London. 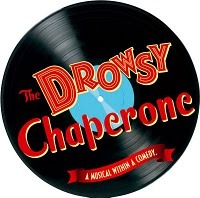 The show starts in darkness with our narrator explaining that he much prefers to listen to his favourite musicals than actually go to the theatre and he proceeds to put on his favourite record, The Drowsy Chaperone from 1928. This show-within-a-show is about two lovers whose wedding is put in jeopardy on their wedding day – by disaster, by themselves, by the drowsy chaperone who is supposed to be making sure the bride doesn’t see the groom on that fateful day and a whole host of stereotypical Broadway caricatures all with their own agendas. But this show is almost secondary to the commentary of Man in Chair who remains onstage throughout. It is wittily structured with him providing constant footnotes about the habits of old Broadway stars and observations such as the particularly dodgy lyrics that pop up now and again, but also little touches like a power cut, the wrong show restarting after the interval and a skipping record are nicely observed in Bob Martin and Don McKellar’s book, keeping us neatly in the postmodern but not obnoxiously so. It is, for me, a huge success. Lisa Lambert and Greg Morrison’s score is great, full of old-fashioned showtunes which whilst not necessarily setting the world alight give a real sense of their passion for what they are doing. But this production takes that as a starting point and runs with it, introducing all sorts of imaginative staging touches which I just loved and are ingenious given the limitations of this small space. I won’t spoil them here apart from to say the knife-throwing was my favourite or maybe the fridge, but the cleverest aspect of Martin Thomas’ design is to never let us forget that we’re in the apartment of Man In Chair. Matthew Lloyd Davies, despite a dodgy taste in knitwear, is suitably geeky but lovable as the narrator (I loved his mouthing along to most of the songs), providing a real emotional centre to the production which keeps it firmly on track. Siobhan McCarthy’s limelight hungry Chaperone is wonderful, possibly taking a little inspiration from a certain Ms Minnelli and staggering around the stage in ‘We Stumble Along’, she provides possibly the best moment in the show. Michael Howe’s master of the pratfall, the Latin lothario Aldolpho is also good value for money. Alumni of BBC 1’s Over the Rainbow talent search programme, Amy Diamond makes a good showing here, in a role much more suited to her than Dorothy would ever have been and there’s a brilliant bit of ‘did she just say that? !” at the beginning of her big number ‘Show Off’ when she sings ‘I don’t want to ride moons no more’: part of the original lyrics to be sure but oh so very apt. I also enjoyed Ursula Mohan’s ditzy Mrs Tottendale, squeaky-voiced starlet Tanya Robb, another squeaky voice from would-be gangster Will Stokes, paired up well with Jo Parsons as the pastry chefs and Gavin Keenan’s appealing and fleet-footed best man George who has a good tap-dancing routine with Ashley Day’s groom. The only real issue I had was with the way Trix the aviatrix was presented, I didn’t feel it worked in either the odd introduction to the character early on or the way in which ‘I Do I Do In The Sky’ is done, it doesn’t really feel in keeping with the rest of the production. And I’m not so sure it actually needs the interval which has been inserted here. A couple of wavering accents and slight timing issues should sort themselves out before opening night but for a show which is still in previews, there’s a remarkable confidence about this company and Tim Whiting’s tightly drilled band. I knew I liked this show last time round, but it was lovely to be reminded that actually, I loved it. At its heart, it is a beautifully eloquent defence of old-school musical theatre, wrapped up in a tap-dancing, vodka-soaked, tuneful ball of fun: affectionate, nostalgic and most importantly, so very funny. Book now. Note: if you’re a little shy, I’d avoid sitting in the front row! If you’re so inclined, you can read my brief review of the West End production here. I have just seen this. I thought it was wonderful. Wasn't it just. I think it really does suit the smaller theatre much better.